1. Low video bitrate, aspect ratio or resolution, e.g. from 4k to 1080p. 2. Do heavy 4k video compression, e.g. change video format to smaller-sized WMV, FLV or so. 3. Switch to better codec compression of 4k video, e.g. from 4k h.264 to 4k h.265. Today, we will focus on the third solution to reduce 4k video size and explain the reason why you need to convert 4k h.264 to h.265/HEVC. It's know to all lowering video parameters like resolution will shrink the file size to a great extent, but this happens at the expense of video quality degradation. While the video format conversion, e.g. from MKV to FLV or WMV is usually called heavy 4k video compression, it keeps the 4k resolution technically the same, but the image can be weirdly noisier or have distracting artifacts. While better compression, such as decoding 4K H.264 to 4K H.265, manages to output video the same as original yet make the amount of data less, without sacrificing any quality. This is because H.265, officially named as HEVC (High Efficiency Video Coding), is so far the video compression standard, doubling the data compression ratio at the same level of video quality. According to Apple, HEVC encoding performs a significantly enhanced coding efficiency and yields an up to 50% reduction in file size compared to H.264 encoding, but the 4K videos in H.265 typically shows fewer compression artifacts and offer smoother playback than the 4K videos encoded in H.264. With the added emphasis on 4K content, the new HEVC/H.265 rises to the throne. And many people, if saved a lot of 4K video downloads in H.264, will prone to convert them to 4K H.265, so that you can accommodate the 4K videos without using up much storage space and consume less bandwidth data required for sharing over networks. - Decode 4k h264 to 4k h265 without lowering 4k video resolution. - Transcode 4k h265 to h264, MP4, MKV, MOV, AVI, etc for iPhone iPad Android. - Upscale 2k/HD to 4K or downscale 4k to 1080p/720p video with smaller file size. - World's fastest speed. 5x faster than others. It's worth noting that the 4k video encoding in H.265/HEVC consumes up to 8-10x more computer power than H.264. As a result, it will take more time to complete the process of 4K H.264 to H.265 transcoding, especially when on a lower-configured computer. That's why many users complain it takes abnormally 20 hours to complete a 5 min 4K video converting from H.264 to H.265 and ask for a way to speed up 4K H.265 encoding from H.264. Is it impossible to convert 4K H.264 to 4K H.265 swiftly? The answer is YES! You can try MacX Video Converter Pro - the best HEVC/H.265 decoder and encoder. Why MacX is the best choice to convert 4K H.264 to H.265/HEVC? 1. 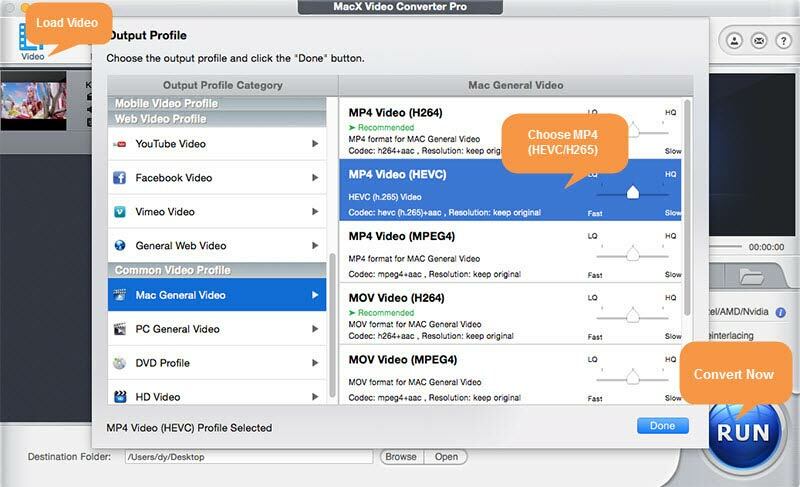 Profiles for 4K MP4 and HEVC MP4: MacX Video Converter Pro is only 4k video converter that adds direct profiles for 2k MP4, 4K MP4, HEVC MP4 and HEVC MKV. That means you can directly transcode MP4 H.264 to MP4 H.265/HEVC and even upscale HD 1080p to 4K without manually adjusting parameters. 2. Downscale 4K to 1080P: It can downscale 4K UHD video to 1080p/720/560/480p with optimal quality reserved but shrinking 4K video file size greatly. 3. Built-in 370+ codecs and 400+ device profiles. You can freely convert 4K H.264 to H.265 or H.265 to H.264, MP4, MOV, WMV, MPEG-4, AVI, FLV, MKV, WebM, etc and transfer 4K/HD/SD videos to the latest iPhone X/8, iPad Pro, Apple TV, iTunes, PS4, Android, etc with full screen playback. 4. High-speed conversion. By taking advantages of hardware acceleration Intel QSV and Nvidia NVENC, hyper-threading technology and making full use of the CPU cores (Up to 8), the conversion from 4K H.264 to HEVC is dramatically accelerated. Test shows it takes only 15min to decode a 4k MKV H.264 movie, which is 6x faster than Handbrake. Below is the detailed guide on how to convert 4K video from H.264 to H.265 at fast speed. But prior to the 4k H.264 to H.265 conversion, please get the specific version on your platforms. MacX works well on both Mac (incl. macOS High Sierra) and Windows (incl. Windows 10). Click + Video button to load the source 4K H.264 video. It takes less than 2 seconds to scan the file. Batch conversion is supported. You can add as many as 4K H.264 videos as you like. When a pop-up Output Profile window appears, you can directly choose the HEVC MP4 or HEVC MKV profile as per your needs, without setting the video codec HEVC manually. The support of the HEVC codec in iOS 11 and macOS High Sierra will help to extend the compatibility with Mac, iPhone, iPad and Apple TV. So here we suggest going to Mac General Profile > and choose HEVC MP4 as the output format. A few tweaks will makes the 4K conversion from H.264 to H.265 faster and higher in quality. 1. Check the Use High Quality Engine and Deinterlacing boxes, this will help to improve video quality greatly and make the interlaced video like common analog television signals into a non-interlaced form. 2. Please remain the Hardware Encoder box checked by default. It will utilize the Intel or Nvidia on your computer to speed up the H.265/HEVC encoding greatly. 3. Click Options on the main interface and choose the CPU Core Use as many as you can. This will make full use your CPU cores to do the 4K H.265 transcoding. 4. You can also click the Edit button to cut off unwanted part of the original 4K H.264 video before encoding it into H.265, add subtitles to the video, etc. Click Browse to set the output folder and tap RUN to begin decoding 4K H.264 to HEVC codec. You shall bear in mind the HEVC implementation into the latest iOS and macOS version doesn't necessarily mean the new codec is recognized by all the previous editions. Only iPhone X, iPhone 8/7/6S (Plus), iPad Pro and 2017 Macs can play HEVC video with a resolution up to 4K 2160p. What is 4K: 4K refers to a resolution of 3840x2160p (8.3 megapixels, aspect ratio 16:9). It has twice the horizontal and vertical resolution of the 1080p HD, with 4 times as many pixels. While H.265 allows the streaming of the 4K content with a bandwidth of 20-30 mbit/s due to its high video compression ratio. 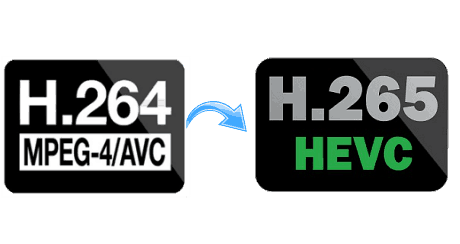 What is H.265: H.265 is known as High Efficiency Video Coding (HEVC), which is a video compression standard offering twice the data compression efficiency at the same level of video quality compared to H.264 AVC. It dramatically improves the video quality at the same bit rate and supports 4K 2160p and 8K 4320p. What is H.264: H.264 is so far the most commonly used formats for the recording, compression and distribution of video content, supporting video resolution up to 2304p. It compress videos much more efficiently than older standard MPEG4. MacX Video Converter Pro will fast transcode 4k h264 to h265 for smaller size without changing the 2160p 4K video resolution. Also support downscale 4k h265 to 4k h264, MP4, WMV, MKV, AVI, etc for iPhone, iPad, Android without a loss of quality.